Over the last couple of months, I’ve been struggling with excessively dry skin. I’m talking about the type of dry where the skin is ashy, cracked and hurts because it’s so tight! 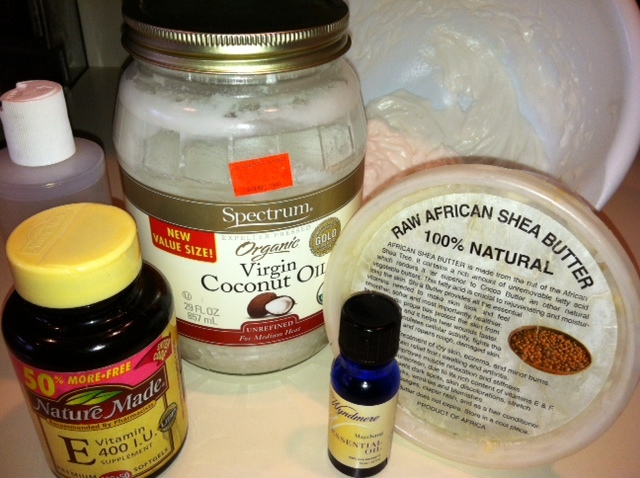 Even after slathering on body butters, lotions, oils … still dry as the Sahara, ashy and hurtful!! I know that the change to cold weather results in less humidity and dryer inside air caused by heated cars and houses. However, I also know that I didn’t experience this last year and, I think that a large part of it was related to my lack of water consumption over the last two months (which I rectified 2 weeks ago). 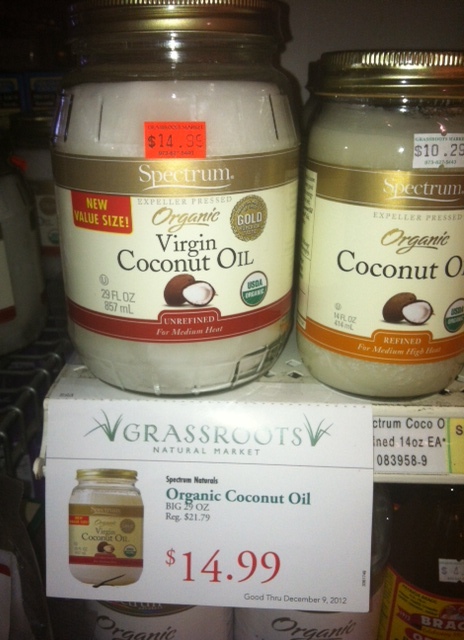 The weekend before last, I scoped out organic unrefined virgin coconut oil (VCO) on sale at my local health food store. It was far cheaper than the same brand at my local Shop-rite. So, we hit up the spot this past Saturday. Yeahhhh … we got two. LOL. 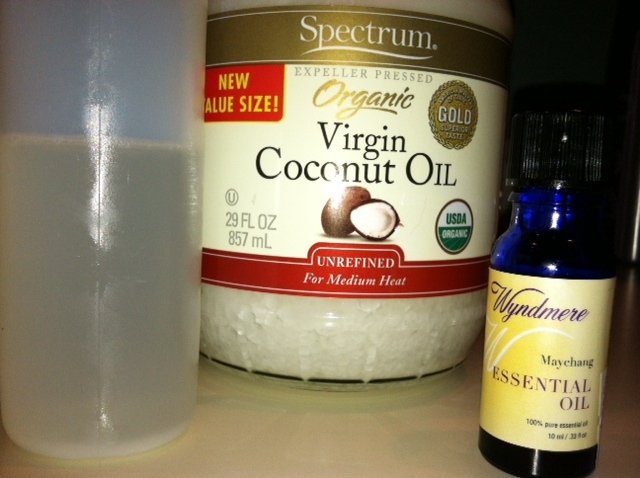 Next, I went to the essential oil (EO) section and as I looked for something that might mix well with the coconut oil. I have lavender, rosemary, cedarwood and thyme EO at home, but those were not scents that I relished. As I was perusing the offerings, a store clerk asked me if I needed any help. I told her that I was looking for an EO that would work well in a body oil made with coconut oil. I also told her that I like citrusy smells (I was holding tangerine EO), but I know that some EOs can be irritating to the skin. She then proceeded to recommend maychang. I’d never heard of it before, but took a whiff from a tester and loved it! I was sold and after picking up a few more things, including lunch, we paid for our goods!! On Sunday, I pulled out my dusty mixtress cap and got to work (if you can even call it that!). First, I scooped out some coconut oil and filled up a 1/2 c. plastic container. 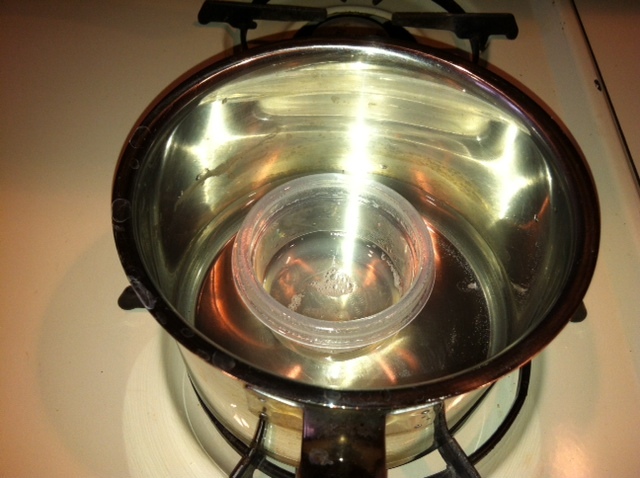 Then, I microwaved a cup of water and dumped it into a pot into which I placed the plastic container. The burner is NOT lit. After several minutes, most of the oil melted and I poured it into a small travel bottle. I added about 4-5 drops of the Maychang EO, shook up the bottle and then repeated the process to make a full bottle of scented body oil. Now, the thing is, coconut oil goes hard at room temp or colder. Out of habit, Wei always throws his bottle of oil in the shower with him to melt it. But, I know that I will forget to do that and end up being mad and frustrated as heck trying to get it melt when I’m trying to get out the door for work. Well, fortunately for me, I came across this post on Saturday: RevitaliseYourHealth.com – 25 Magical Things to Make with Coconut Oil (Note: registration may be required). It had links to all of these great coconut oil recipes for body, hair and health!! 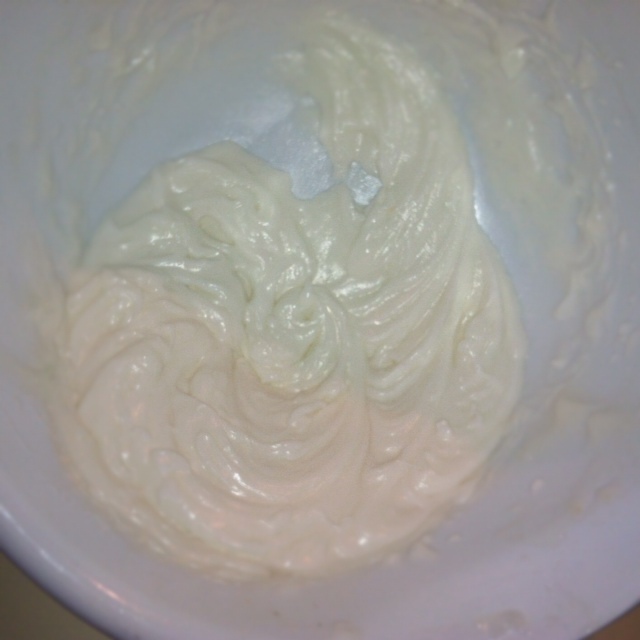 The first was a super simple recipe was for a coconut oil “whip” that the writer made to deal with the issue of coconut oil hardening! It only contained 1 required ingredient (coconut oil, obviously ;)) and 2 optional ones! I was SOLD! I had my coconut oil, my vitamin E capsules and my EO! So, I pulled out my woefully unused electric hand mixer and got to work. I threw in the cup of coconut oil, the oil from five 400 EU vitamin E capsules, and about a 1/4 c. of shea butter … just because. I set the time on my microwave for 7 minutes and whipped the ingredients on medium to high. The oil and shea butter blended quickly and easily and the 7 minutes flew by. Once I was done with that, I added about 6-7 drops of the maychang EO and blended for another 30 seconds to a minute. Next, I had to find a glass jar in which to store my lovely whip! All I had was plastic containers! But then, I thought of a source!! I asked Wei to open the fridge and found two small old jars, one filled with pesto (8 oz.) and the other with minced garlic (4.5 oz) that could be discarded. We washed them out with soap, water and then a little white vinegar to kill the smell. I opted to use the bigger pesto container … one, because it was big enough to hold all of the whip; two: because it didn’t smell like garlic *LOL*. So, now I’m going to admit that I fibbed a little earlier when I said that I hadn’t done ANY Christmas shopping. You see, as I was making the whip, I had a ¤¤¤Brain Blast¤¤¤!! What a great homemade gift for my 12 direct employees!!! It’s practical, useful, personal, creative and smells good!! But, I needed more small glass jars … and not repurposed ones!! LOL! So, I posted the first pic on IG and asked for ideas on where I could find them! 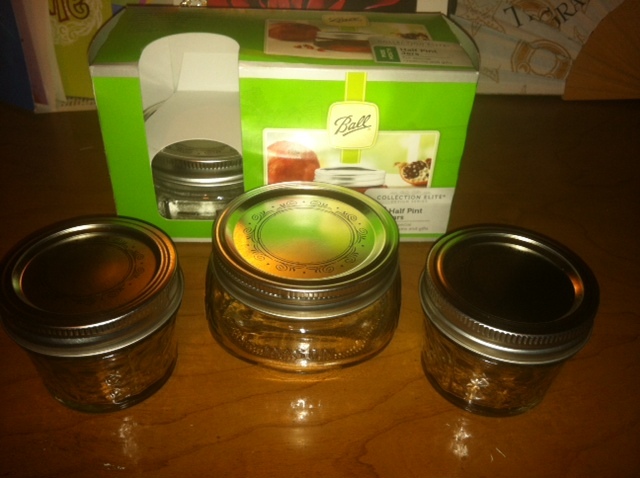 I got lots of great suggestions and decided to go with small mason jars from Walmart or Ace Hardware. I found four packs of 8 ounce mason jars at Walmart for less than $4 each. But, the jars and tops were wide, so I decided to hit Ace to see if their jars were a little smaller in diameter. Well, I found 4 ounce jars in a 12 pack for $8.49 instead! PERFECT!! So, I got those for the gift body whips and plan on returning all but one of the 8 oz. jar 4-packs (I’ll keep one box for my own personal use ;)). Finally, I got another really cute idea from a young lady on IG and I have some other “additives” for the mixes. But, I don’t want to give it all away! So, you’ll learn the end results of my little DIY Christmas gift project when I finish it! Or, if you just can’t wait, you can read the comments on the IG post here and figure it out ;). But first things first, I need to pick up some more coconut oil!! I learned that I might be able to get a better deal at Trader Joe’s, so I may go there or order it on Amazon! Hmmm, any other suggestions (This would be a good addition to I Found It Cheaper, right?). Now, wish me luck that now that I’m drinking enough water, my new coconut oil and whip will work to keep my skin moisturized and supple!! Do you use coconut oil on your body? Have any advice to maximize the benefits and/or a great recipe to share?